Whatever your reason for needing the best automatic clay pigeon thrower is, we’re here to help! We’ve searched all over and reviewed a number of automatic clay pigeon throwers, so you don’t have to dig through the shelves. Are you lacking a friend who is capable of launching clay pigeons into the air for you? Does that friend simply get tired of how often you enjoy going out and shooting? Believe it or not, there are a lot of factors to take into consideration when buying an automatic clay pigeon thrower. We’ll make sure you know what to look for when making your purchase! What Makes a Great Automatic Clay Pigeon Thrower? Even though “automatic” is in the name, automatic clay pigeon throwers are pretty much a standard these days. We’ll discuss the most important aspects of an automatic clay pigeon thrower before we give you specific models to go out and buy. To use an automatic clay pigeon thrower, you should have no trouble setting it up on the ground. You don’t want something that takes two hours to set up, but you also don’t want a thrower that will crumble underneath its own weight. Your clay pigeon thrower should ideally be steel, and if possible, get one with an aluminum arm. Caring for your thrower is important, but not as important as dedicating time and maintenance to your guns. The effort you put into cleaning and surfacing your rifles or shotguns should not be any less than what you do for an automatic clay pigeon thrower. The other benefit of high durability in a clay pigeon thrower is the resistance to elements. Obviously, you’re going to be doing your shooting outside, and with the sky comes unpredictable weather, humidity, and allergens. If you expose your clay pigeon thrower to the sun for too long, permanent damage is entirely possible. Once you buy an automatic clay pigeon thrower, you won’t want to be disappointed with its performance. You’re paying money for a product that should work well, and the last thing you want is a thrower with a dead arm. That said, how well the thrower performs is going to be proportional to the price. If you’re a seasoned shooter and you have a great amount of experience, you’ll probably be more interested in consistency and reliability. For the younger or less experienced shooters, you can get away with an automatic clay pigeon thrower that isn’t top-of-the-line. We’re not saying to go with a poor model, and we haven’t included any on this list that are downright “bad.” The point is that performance commands a higher price, and if you’ve just unloaded a ton of money on a new gun, you may not have much leftover for a pigeon thrower. Keep track of the predicted distance of the thrower, the level of the motor, and the amount of time needed for another throw. You’re not going to be able to shoot anything that gets tossed at the ground, right? So, it’s important your automatic clay pigeon thrower can adjust to the proper angle. All throwers inevitably offer some kind of angle adjustment tool. But, they’re subjective, so go through our guide and figure out which one will suit your needs. The main thing to remember with angle adjustment is that it won’t make you an expert, nor will it dumb you down. There’s nothing wrong with honing your skills and accuracy by making slight tweaks to the clay pigeon thrower’s angle. That will enable you to hit more of your targets. Nobody is judging you because you’re using all of the features available to you. Obviously, you’re going to use your automatic clay pigeon thrower quite a bit. You wouldn’t be shelling out the money necessary to buy one if you weren’t going to make this a regular habit. Knowing this, you need one that should be as portable and easy to transport as possible. A cumbersome setup and too many loose parts will make packing up the thrower a miserable experience. You’ll be working your arms and shoulders enough when shooting, and you don’t need to add a back strain to your list. Unless you’re the kind of person that enjoys setting up the same thing over and over again, choose an automatic clay pigeon thrower that is easy to assemble. Keep the safety features in mind when setting up and remember the same precautions with an automatic clay pigeon thrower that you use when handling your guns. Everyone likes free stuff, so when an automatic clay pigeon thrower includes some bonus items, it never hurts. If the thrower comes with something like a battery cable or guide rods, take advantage of the offer. You don’t want to open the box and find out that one critical nut or bolt is missing, forcing you all the way back to the store or the website where you placed your order. Check into the thrower’s warranty. If the arm snaps, or if the angle stops adjusting to your desired settings, the manufacturer should cover it. Keep your receipt from the store or website you purchased it from and place it near all of the other paperwork for your guns. Now that we know what features to look for in an automatic clay pigeon thrower, let’s check out the reason you opened this page — the clay pigeon throwers! To start, the Trius One Step Trap weighs in at over 20 pounds. Not bad for an automatic clay pigeon thrower. The weight stabilizes it so that you won’t have to worry about it falling over and shattering if it’s perched somewhere. The colors are bright and noticeable on the thrower, standing out amongst the grass or wooded areas where you might decide to shoot for the day. If you’re interested, you can mount this Trius model and give it a slight nudge to the left or right. Think of it like you’re shooting on a hook or a slice. You’ll love the fact that it comes partially assembled, reducing the time it takes to set up and start shooting. You won’t need a partner around with the multiple settings available on the Trius One Step. You can throw regulation singles and piggyback doubles with the ease of one foot, eliminating any need for a spotter. If you want to take advantage of the left/right directions, all you need to do is move the spring tension. That’s all it takes. Start firing away at an angle and see how well your accuracy holds up. Thanks to the lack of tension on the arm, using the Trius is a breeze. One thing we should point out is the lack of any instructions on assembling the shooting mechanism itself. While the manual tells you how to set up the base, you’re on your own when it comes to putting together the arm and launcher. You might initially look at the WingOne Clay Target Thrower and say, “That’s it?” The answer is yes, this is it -– it’s a handheld automatic clay pigeon thrower. The lack of bells and whistles might throw some off, but for those on a budget and who don’t mind using their hands, this is a bargain. 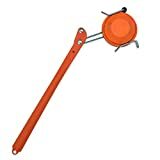 It looks small, and you’ll need a steady grip on this thrower to ensure that it doesn’t fly out of your hands. Don’t worry too much about your shoulder, as it doesn’t resemble some of the older clay throwers you may have read about or seen in videos. We mentioned the need to watch out for the elements when in the market for an automatic clay pigeon thrower. Thankfully, the WingOne model isn’t affected by weather, so you can stand out in a raging storm and fire away if you prefer. With an auto-cocking mechanism, this thrower lets you fire off up to five times faster than other launchers you may have used in the past. Because it’s a handheld launcher, you won’t be able to fire off more than one clay pigeon at once. And, of course, you’ll need a friend along if you choose this model. Keep in mind, if you’re looking for multiple targets at once, you’ll need to find something a little higher-priced. If not, this one is very tough to pass up. 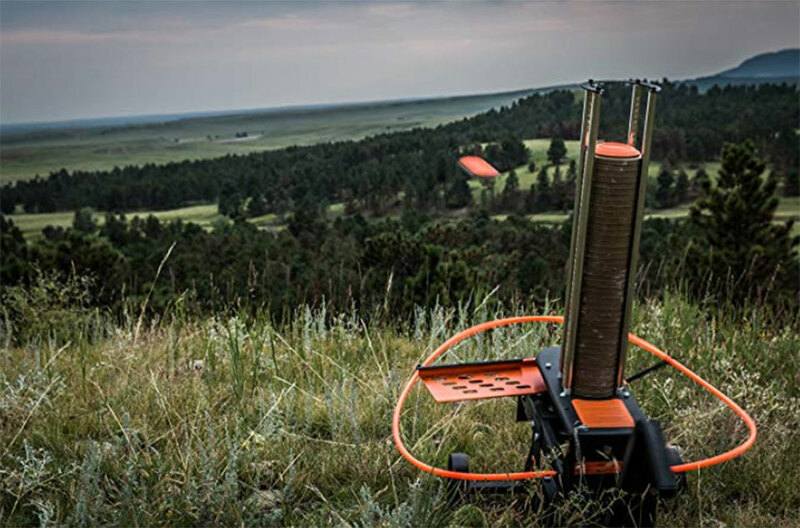 If you’re looking for an automatic clay pigeon thrower that can handle tons of discs at once, this one has you covered. The Do-All has the capacity for up to 25 discs. It’s capable of launching up to 55 yards and only needs a couple of seconds to reload. If you need to add extension cords, you can feed several of them into the Do-All Outdoors model. Thanks to the feeder tray’s seamless throwing arm, there’s no risk of any of your pigeons breaking on their initial launch. The color of the safety ring also takes care of any precautions you’ll need when using the Do-All thrower. Unfortunately, you can’t make any directional adjustments. You’ll only be shooting straight with this one, but the foot pedal allows you to make timing adjustments while you’re in the middle of a session. The Do-All feels incredibly portable, and you won’t have any trouble tearing it down and taking it with you. Even with all of its extra features, you can transport this in a matter of seconds. The Do-All runs on a 12-volt battery which you’ll need to purchase separately. While this model runs on the higher end of the price scale, it’s an investment you will be able to enjoy for years to come. Which Automatic Clay Pigeon Thrower Is for Me? Choosing the perfect automatic clay pigeon thrower to add to your arsenal depends on your personal preferences. You also have to consider how many people might come with you on a day of shooting. If you know you’ll be joined by others, the WingOne target thrower is an excellent choice. Not only is it cheap and reliable, but it’s small enough to be passed around to your friends. You’ll be able to take it with you easily and rotate launching duties among a few other people. That works out great if your shoulder needs a rest from firing an especially powerful shotgun or rifle. If you have the extra money after purchasing a gun, our top choice is the Do-All. It’s going to set you back a bit in terms of price, but the high capacity for discs and the ability to easily break it down really impressed us. Its durability is unmatched, and you can even hold it in the ground with a set of ground spikes included with the launcher. For making quick adjustments on the fly, the Trius is fantastic. There is more customization available in the angle and velocity for the Trius than the Do-All, perfect for fine-tuning your aim when clay pigeons veer off in a specific direction. Realistically, any automatic clay pigeon thrower that we mentioned in this article will suit you well. Always remember the safety involved with using an automatic clay pigeon thrower. Not only are there firearms involved, but the clay pigeons themselves can cause serious injury if someone isn’t careful. The colors of each of the throwers we have reviewed here ensure that you know exactly where they are at all times, as well as the origin of your clay pigeons.